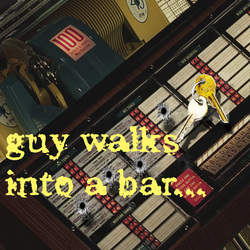 A guy walks into a bar to steal a key but instead finds a bartender, an angry girlfriend and "guy walks into bar" jokes. So an angry guy with a gun walks into a bar demanding a safe deposit key from the bartender. He knows the bartender, of course, but it turns out everyone in the bar is connected to each other in one way or another. Two waitresses are in there, one with an apparent liking for the bartender and the other with an obvious anger for our man with the gun. An old lady sipping a gimlet has a few words of wisdom for the patrons of the bar, including her beleaugered lawyer and chauffeur. But what about the young innocent girl and two businessmen telling jokes? And that safe deposit key? Where do they all fit in? As lights flicker on and off in the bar, as we follow our characters through parks, banks and, well, bars, the punch line to a guy walks into a bar is revealed. Tell us your best "Guy Walks into a Bar" joke.